Pour 1 tablespoon melted butter into baking dish to coat bottom. 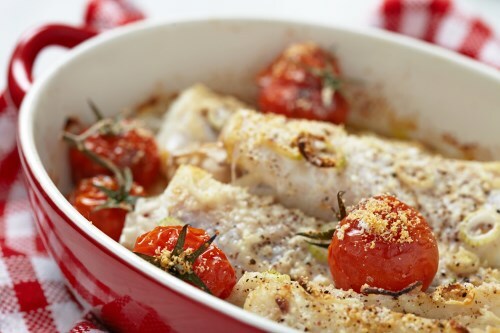 Arrange the cod fillets in the dish. Pat fillets dry using a paper towel. Spread the Boursin cheese evenly over the fillets. Pour the tomatoes over the tops. Season with salt and pepper to taste. Sprinkle with Parmesan cheese. Drizzle with remaining 1 tablespoon butter. Bake, uncovered, in preheated oven for 25 minutes.